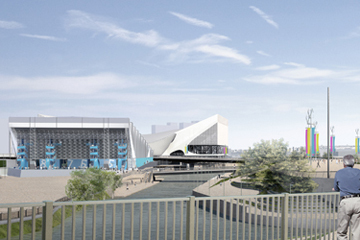 Featuring both a warm up pool and competition pool, the Water Polo Arena is situated adjacent to the Aquatics Centre. It will be removed after the Games and elements from the venue will be used elsewhere in the UK. Materials will be available through the rental market to fulfill this purpose. Its ribbed and iconic roof is made up of air inflated recycled cushions, giving it a dinstinctive design as well as appearance, in addition to a distinctive silver wrap on its roof. It is in the south east of the Olympic Park, through which the historic River Lea, home to bronze and iron age settlements, runs. The 5,000 seater venue will share facilities with the Aquatics Centre in what is one of the tightest areas of the Olympic Park. Hungary will be looking for their fourth gold medal in a row at London next year and their sixteenth in total in the Water Polo discipline. 33 events will take place over 15 days at the Water Polo Arena.